"What would you say is the current holy grail of pop culture? A Mother 3 release outside of Japan? Mother 4?" "Well, for video games, Half-Life 2: Episode Three. For all of pop culture? Hmm… A Dream of Spring? No, a Smiths reunion!" 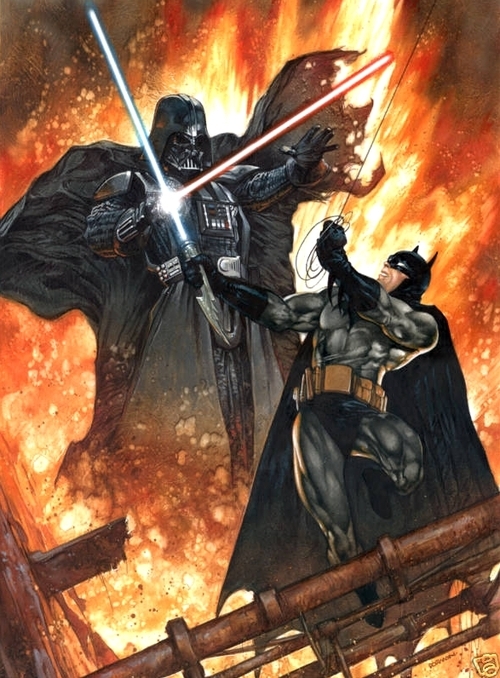 "A Star Wars vs. Batman film." "What? How would that work?" "A time-and-space warp plus Spaceballs. Not long ago in our galaxy, the Galactic Empire invades Earth for its resources." "Warner Bros. owns Batman, and Disney owns Star Wars, and their properties have united before, in Who Framed Roger Rabbit?." Television Show Idea: What if the demons in your closet were actual creatures in your closet? Picture a mix of Herman's Head, Pokémon, and The Incredible Hulk. Action Sequence Idea: Escape from a moving subway train inside a flooding underwater tunnel. Idea: Earplug-sized and -shaped tampons for nosebleeds – like absorbent Invisalign.